Without doubt the main theme of this section of the Cumbria Way was the weather. I don’t know how warm it was during the day but it was 28°C when we were driving home in the evening; and there was little if any breeze. We parked in the NT pay and display car-park at Old Dungeon Ghyll and got a local taxi to the Crown Inn at Coniston and there rejoined the Cumbria Way where we had left off previously. The weather was glorious, with sunshine and clear blue skies. I had remembered my sun hat but had forgotten sunscreen but was able to scrounge some. 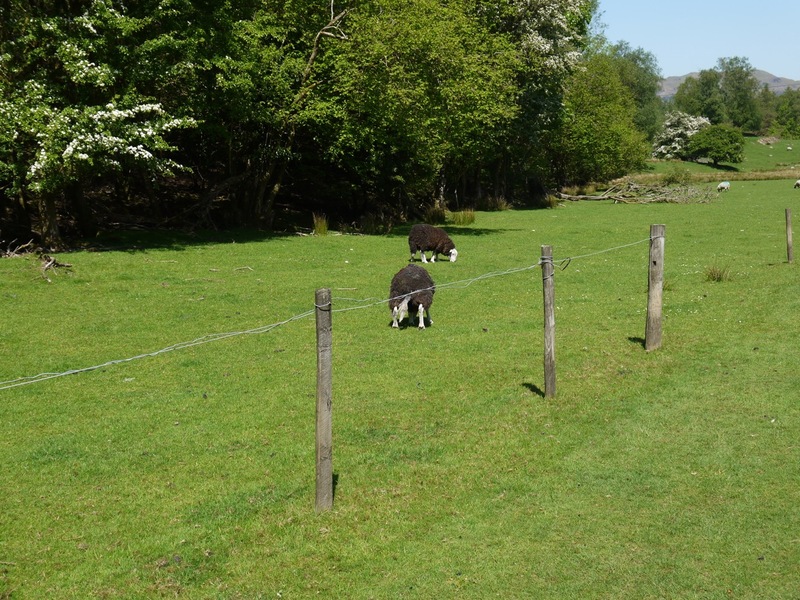 We set off along the road out of Coniston, then turned along a minor road for a short time before crossing Yewdale Beck and walking through park-like farmland, passing resting Herdwicks with their lambs, and heading towards the shade of Guards Wood. Along our way we passed the Dog Kennel Folly, a gothic styled edifice with turrets and arrow slits built originally to house foxhounds. It is apparently a listed building. We climbed gently and passed through Guards Wood at its narrowest point, then had a gentle descent back down to Yewdale Beck at Low Yewdale. There was then a steady climb up through Tarn Hows Wood and then more uphill along a minor road over Tarn Hows Intake. (An Intake being an area of higher fields by open fells…the same as an outbye?). Having left the trees behind and climbed out of the valley we now had views back to the Old Man of Coniston and forward to the Langdale Fells. I wasn’t sure which fells we could see, but looking at the map now, I am pretty sure that the hills in the distance were Blea Rigg. Though the most common beast to see in the fields was the Herdwick we did also see some Belted Galloways to remind us of home. For some reason I had misinterpreted the contour lines and was expecting to be descending to Tarn Hows. Audrey pointed out that a tarn would be high up and the road was undoubtedly climbing. At least we were close to the highest point for the day. We stopped for a photo with the Old Man of Coniston behind us. By the time we reached the tarn itself we were ready for a break. 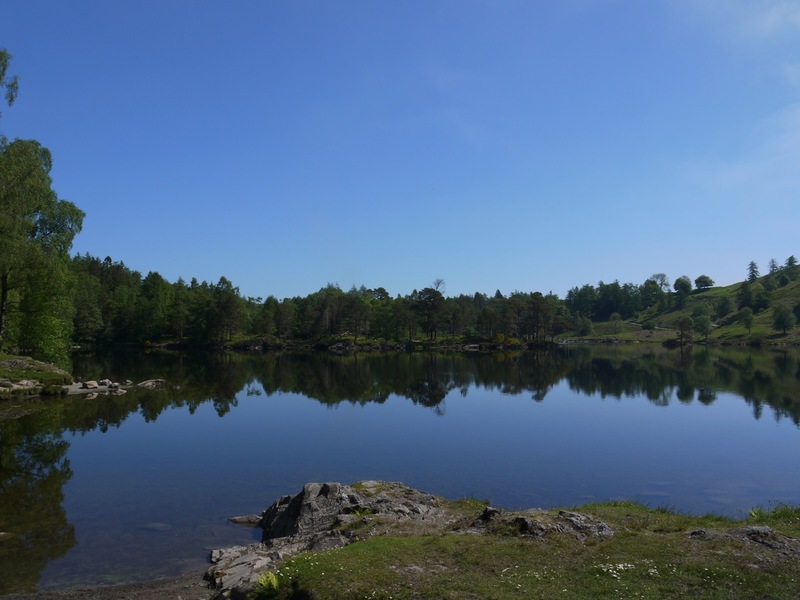 The Tarn was very pretty in the sunshine and the woodland track was easy going on the feet. There were several benches but always in direct sunlight, so we pressed on, deciding that shade was more important than sitting down at that point. We paseed a fallen tree with what from a distance I presumed to be fungus growing over its entire trunk, but close up these were coins hammered or pressed into wood. When we did find a bench in shade there were coins embedded in it as well. 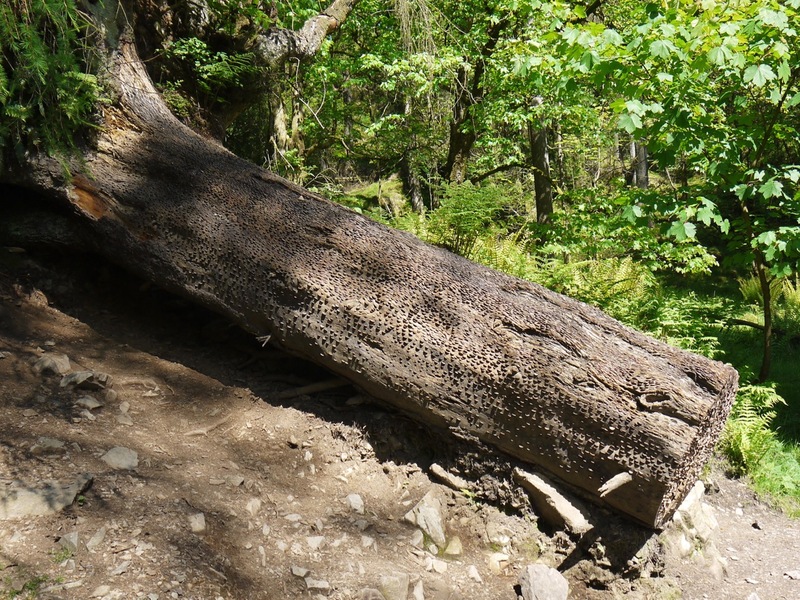 We saw several other trunks or stumps embedded with coins later in the day; apparently pounding a coin into this dead wood is said to bring luck. Ten minutes to sit, rest, and have a drink was welcome by this time. The Cumbria Way doesn’t have consistent waymarking and we did find ourselves uncertain at times despite having the map to hand at all times. At those times we referred to the CW book, but sometimes found it unhelpful. A good example was the turn off from the path along the tarn. It was clear from the map that we should leave the main track perhaps 250m before the end of the tarn, but the end of the tarn was not obvious until you actually reached it. When we found a track leaving, there was no CW marker, so we looked in the book, which said we should leave on a track with a signpost to Arnside and Langdale. The track we met was signposted to Skelwith Bridge and Langdale, so we decided to pass it, only to find ourselves at the end of the tarn. So we took retraced our steps and took the track despite the sign differing from the description. This took us through woodland on a rough narrow track, all the time wondering if we had strayed from the route. Then after about 0.5km we met a very rough wider track and a signpost with a CW plaque. We passed Arnside Lake and then continued on the rough track across moorland with our last views back to the Coniston Fells. We crossed the A593 at Arnside (the one not mentioned on the signpost), and walked parallel to the road through a field with sheep and lambs. The was a curious “fence” made of one or two strands of wire, high enough that a sheep could easily walk under and incomplete. Its only use could be to encourage walkers to remain beside the wall between the field and the road. This did seem quite an effort though since a stream ran less than ten metres away and would have discouraged walkers from straying that way. This route eventually led us back to the road but then immediately turned along a minor road climbing beside the Woodlands of Tongue Intake towards a wee hill, Great How. Once over the col beside the hill we were in Little Langdale. We were now heading for High Park Farm, which served refreshments, but we ere not ready to stop at that time. After the farm we followed a well made farm track to the edge of some woodlands and then took the less travelled, lower, woodland path so we could visit Colwith Force. This was quite a pleasant walk but I can see why it is an alternative, rather than the main CW route here. If over used I am sure it would erode quickly and in wet weather it would be easy to slip and fall where the track is at an angle more appropriate for contour hugging haggis. I dropped the map here and had to clamber down to retrieve it. Colwith Force wasn’t perhaps at its best with no recent heavy rains. It represents a fall of about 40 feet in the River Brathay, over a series of small waterfalls. 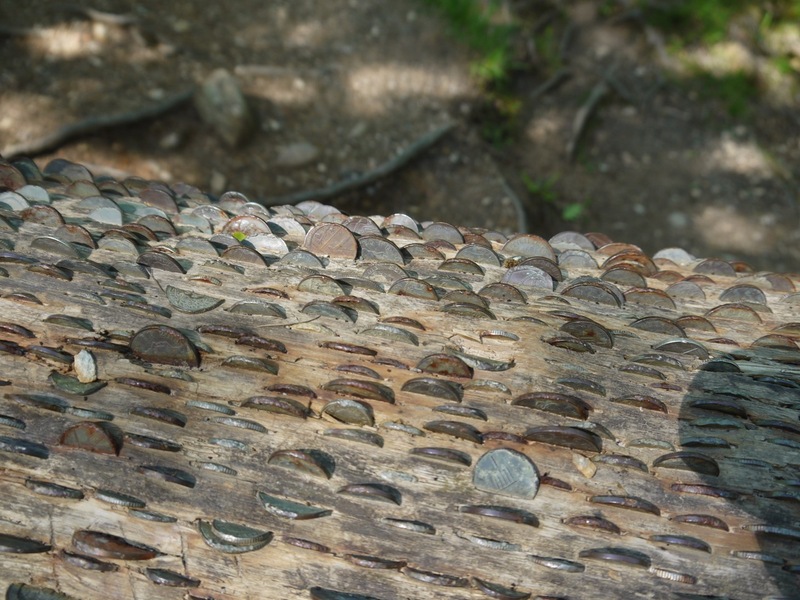 Above it was another “wishing tree” embedded with coins. We rejoined the main CW route by a road bridge over the Brathay, but the CW turns along the road away from the bridge for a few metres before crossing a strange hybrid between a styal and a gate, then climbing some wooden steps and heading up past Park Farm and Park house. By this time we were looking for a good lunch spot and we found it beneath a large oak tree with a couple of rocks for seats. As much as I enjoyed sitting in the shade a the large oak tree, the rock I had chosen as a seat proved a little too sloped and low for my hip joints. 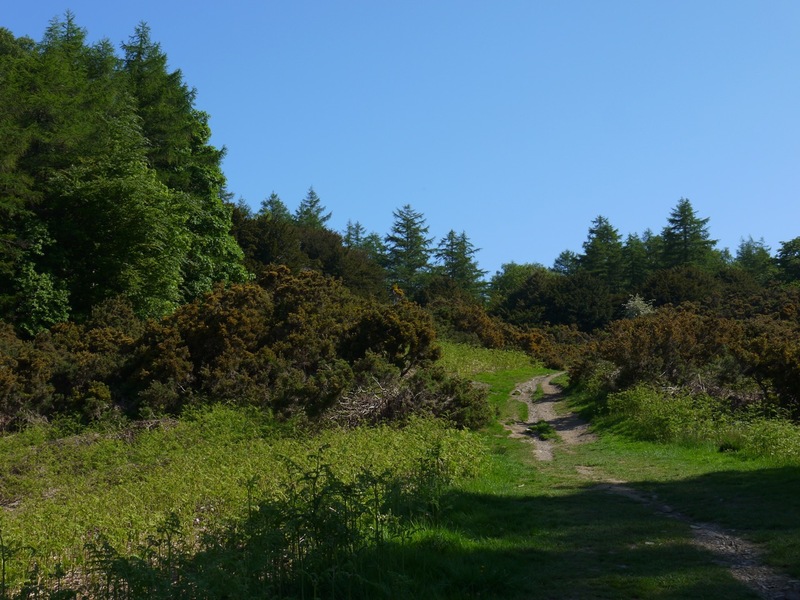 So at a time when I should have been relaxing, there was a growing tension in my muscles which eventually brought me back to my feet and doing stretches. A breeze would have been pleasant but the air remained still. 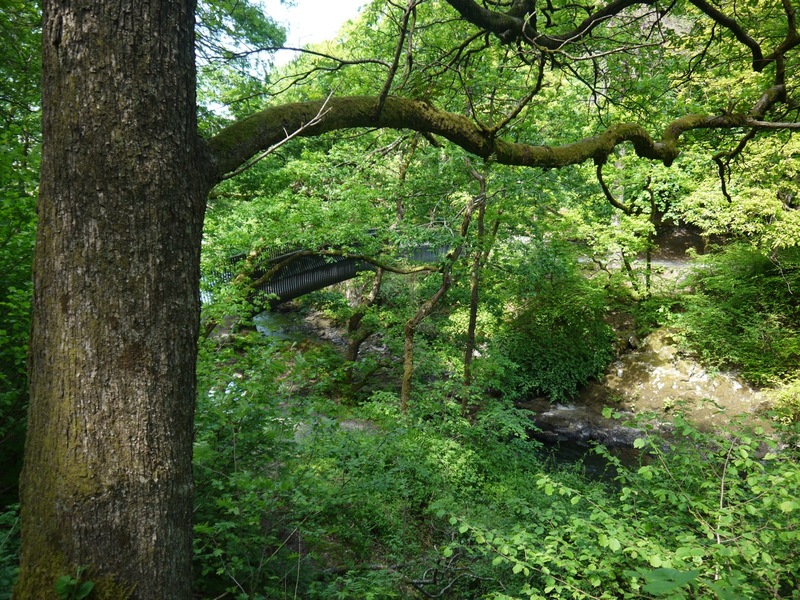 The next section took us into the woodland beside the little village of Skelwith Bridge, crossing the River Brathay near Skelwith Force on the Trevor Woodburn Bridge, which is named after the local man who originally put forward the idea for a ‘miles without stiles’ route for pedestrians, cyclists and wheelchair users avoiding the traffic on the existing road bridge. 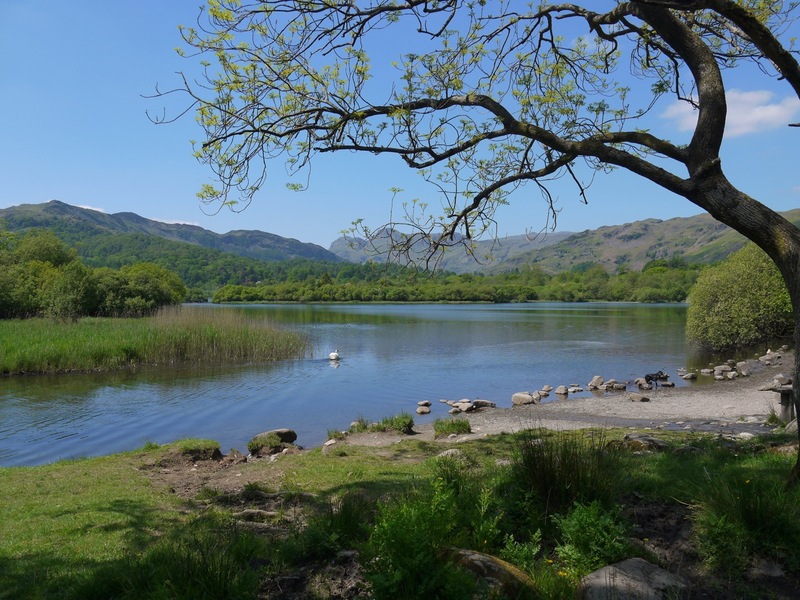 For the next few miles we walked beside of close to the River Brathay, past Elter Water then beside Langdale Beck. 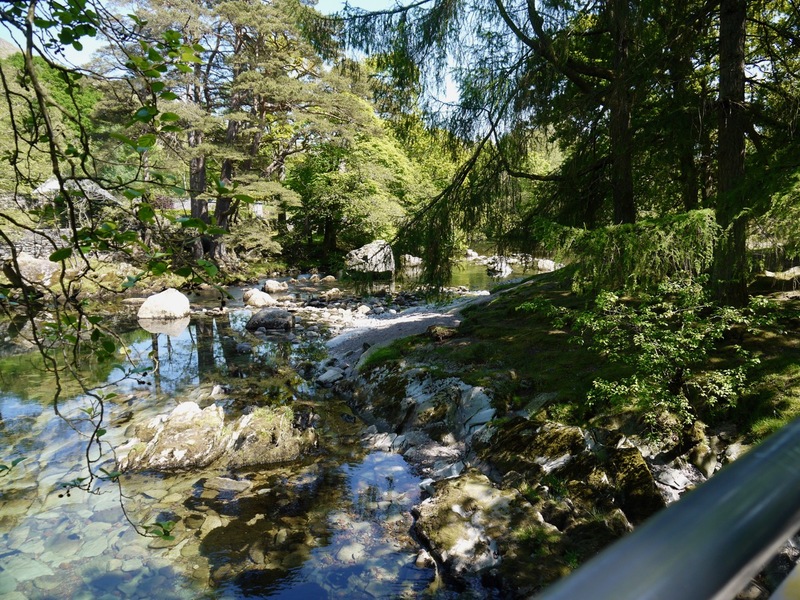 Crossing back and forth in Elterwater, Chapel Stile and Dungeon Ghyll. 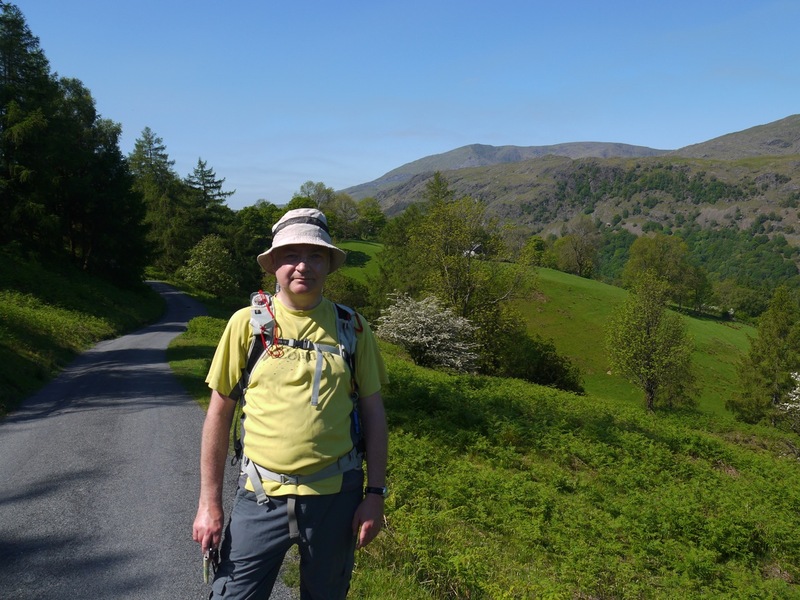 Much, but not all, of the walk to Elterwater village was shaded by riverside trees, but the temperature was definitely climbing and as we approached Elterwater village I was flagging a little, and had to stop for a drink of my, now warm, water. The CW actually misses Elterwater village, passing between an old slate quarry and the river, through very welcome woodland shade. The river here was beautiful, the clear water covering multicoloured stones. I think at any other time I would have wanted to stop and dangle my feet in the water, but I was in “one foot after the other” mode and just kept trudging on. Having crossed the river here we were brought back to the “main” road and found ourselves walking by the Wainwright Inn. It was a team decision to call in for cold drinks. I would really have loved a shandy but since I would be driving later I stuck to soft drinks. Much better than drinking my warm water. While sitting in the shade outside the pub, my hands cradling an ice cold soft drink the countryside noises were interrupted by what sounded like an air-raid siren. I mused jokingly that we probably had 3 minutes before the nukes hit Sellafield. The siren stopped and then there we heard the boom of an explosion. While I was trying to get my mind around this, Audrey realised it was from the nearby slate quarry. The ice cold drinks went a long way to kick me out of trudge mode and back into strolling mode. From there onwards there was to be little in the way of shade. 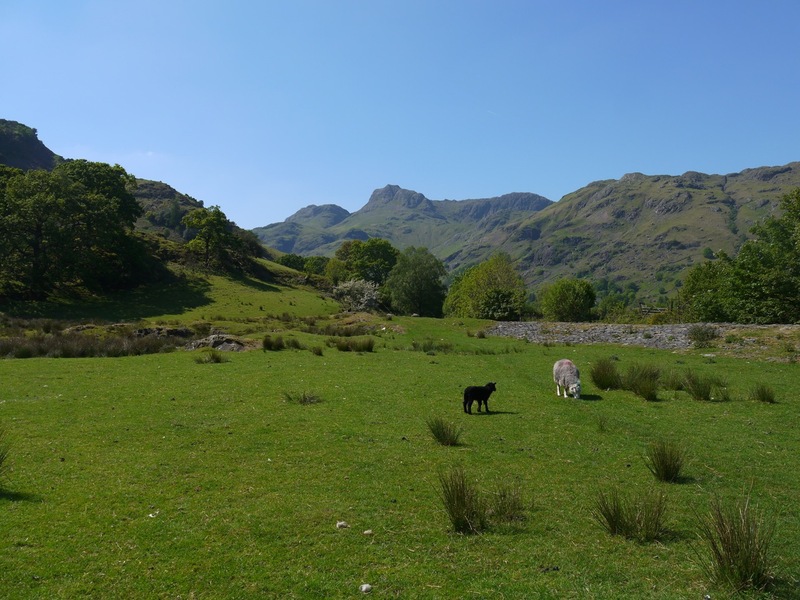 The remaining walk was half flat farmland and half rocky hillside, with Dungeon Ghyll and Stickle Ghyll visible on Langdale Pike ahead of us, drawing ever so slowly closer. I think Audrey hit her own “tank empty” state along here and defaulted to trudge mode much as I had done earlier. 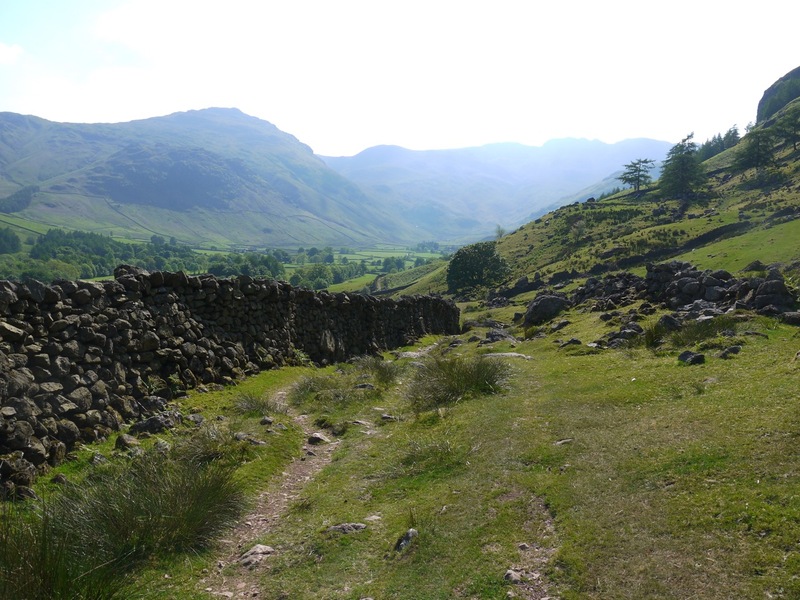 The path across the base of Lingmoor Fell was energy sapping, with ascent along rocks that shifted underfoot and required continued care and watchfulness for every step. 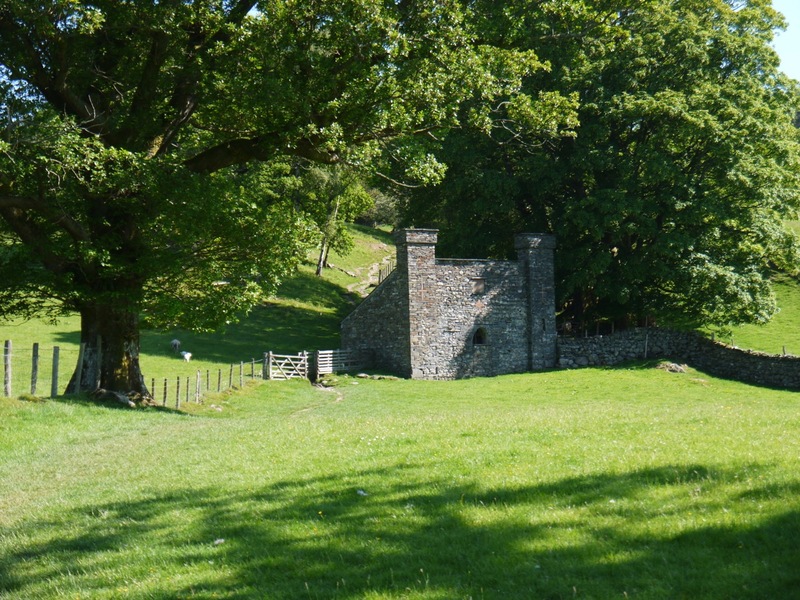 But eventually we could see the buildings of New Dungeon Ghyll, not the end of our walk , but another opportunity for buy some cold drinks. At New Dungeon Ghyll, or more accurately Sticklebarn we crossed into a car park and found a sign for Old Dungeon Ghyll, half a mile. Encouraging news, I felt. We had a cold drink watching a couple attempt the Sticklebarn loose rope challenge, which involved walking a loose “tightrope” about six inches of the ground. I decided against trying it since I could foresee broken bones as an outcome for me. Refreshed again we set off back to the signpost to ODG but once there I realised that it was not the route of the CW, which skirts the lower slopes of the hill above rather than crossing the farm fields. So that final half mile turned out in fact to be 0.9 miles of rocky track. Once Back at Old Dungeon Ghyll we turned off the GPS trackers, took off our rucksacks and boots and headed to the bar for a celebratory ice cold drink. CW2 was five miles shorter than CW1, but felt longer, mainly because of the heat I think. We decided that the next, 17 mile section, would have to be split if we were to enjoy it. This entry was posted in Cumbria and tagged Cumbria Way, Low Level. Bookmark the permalink.